I am a solar addict. Specifically I am a solar power addict. We have two 250 watt solar panels strapped to the back of Tango and I am enamored with them. I know that photovoltaic panels have been around for quite awhile but I still get chills when I think that a hydrogen fusion reaction on a star 93,000,000 miles away is making it possible for me to write this blog entry right now. Since we are now attached to a mooring ball in Biscayne Bay we have not had access to shore power for well over a week now. I was a little nervous because our solar panels and batteries have never been tested to this extent. Since leaving Maryland we have had only single night anchoring opportunities. 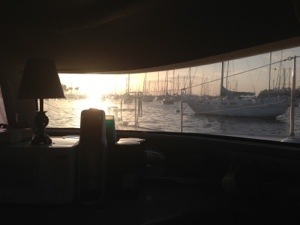 The rest of the time has been spent marina hopping where we always had shore power to keep us warm/cool/entertained. I am happy announce that the panels are performing beyond my expectations. 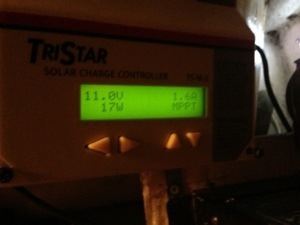 The sun has been shining every day now and our batteries are usually charged up to 100% by around 1PM. This means that from 1PM until the sun drops low enough on the horizon to become ineffective for power generation, we have a surplus of energy. If we had more batteries we could store that energy for later use. Since we only have room for two twelve volt batteries at the present time, this means that afternoons are filled with extravagant power usage. 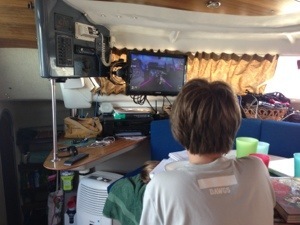 Right now the girls are taking a break from their studies to play an hour or so of “Little Big Planet Karting” on the Playstation 3. I am charging up all of my i-Devices, my Nike FuelBand, and this here MacBook. The refrigerator is doing its thing. Robin is running all of her things for work, including her laptop, charging her phone, powering our wifi hotspot(s), and our cell phone booster. Pretty cool I’d say. Beyond all of this though, I have learned to humble myself to the concept that energy is nothing to be wasted. One of my favorite comedians, Louis CK, made a humorous observation about the way things used to be that seems apropos. He reminisces about how we used to have to actually go to the bank to get money. Remember that? He also accurately states that when you would run out of money you would just say “well I just can’t do any more things now.” I am finding that, in my own life, I need to get back to those days. I have spent the last 20 years spending money that I didn’t have to buy things that I didn’t need. Energy usage is kind of the same deal. Being independent from the grid doesn’t allow one to “spend” energy that you don’t harness. This position is really one that should be practiced on a global scale, but I’m not going to speak to that right now. 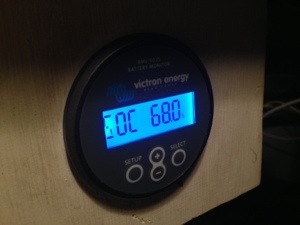 On a local scale (the boat) we all pay careful attention to the State of Charge (SOC) of our battery banks. We also monitor the weather closely. If, like today, the sky is blue and the sun is doing its thing, we can “afford” to go a little crazy with the power. When the weather turns to the dark and stormy side, (especially for multiple days in a row) we have to cut back. It’s as simple as that. The weird thing is that the cloudy days don’t really bug me anymore. I no longer feel a sense of dread when the power is not flowing into our batteries. To me, it’s the way things should be. It’s natural and it’s right. When it gets cloudy, we take a walk, watch the other boats, read a book, or, heaven forbid, we talk to each other. I say this tongue in cheek as we Becks talk all the time. Always one to look towards the future I am already thinking about our lives back on land. You can bet that wherever we end up will have an abundance of energy saving features such as LED lighting and multiple sources of energy generation, be it solar, wind, and/or whatever technologies come down the pike. I promise to never fall into the trap of “spending what we don’t have” again, money, energy, or other. This is what the State of Charge looks like at dawn. This was taken at dawn. By 11AM we are usually pulling in about 500 Watts on clear days. The sun is out! Time to play! Great post. How cool it would be if we all lived within our resources.